Wildlife documentary. How does a chimpanzee see the world? A research project attempts to answer that question by giving chimps a special camera. Wildlife documentary. 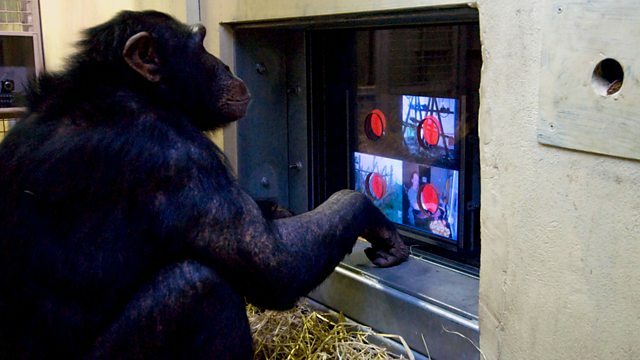 How does a chimpanzee see the world? A research project at Edinburgh Zoo is designed to answer just that question in an innovative new way - by training chimps to use video touch screens and giving them a special chimp-proof camera. How will they react to tools which in evolutionary terms are a few million years ahead of them? As chimp specialist Betsy Herrelko finds out, trying to communicate with chimps using video technology has its trials and tribulations as power struggles, bites and fights get in the way of the hairy chimp directors. However, by the end of the programme we are privileged to see the world's first film shot by chimpanzees.